The Sony MU-R201 came after the ultra expensive Sony DRE-2000 and was the first of it’s kind to offer true stereo processing. It was something of a sleeper in the west with Roger Nichols being one of it’s few true believers, having used it on everything he mixed including all the Steely Dan mixes he did. In Japan you would be hard pressed to find a studio that does NOT have at least one Sony MU-R201 in their racks even today, many have two. It is difficult to pinpoint exactly what it is about this unit that makes it so good, but it sits in a mix really well and is very well made, in particular the ultra rare remote control with it’s solid steel casing is very solidly built. All circuits from the input to the output stage are equipped for stereo processing. The key device of the Sony MU-R201 is a newly developed 2-channel audio processing LSI (Digital Presence Synthesizer CXD1079), which creates stereo effects not possible with two monophonic reverberators. The result is striking, high-quality reverberation. Musicians, recording engineers and sound technicians from all over the world have contributed to select a total of 100 presets which are stored in the memory of the Sony MU-R201. The user can immediately choose a setting for any application. The EDIT and EQ (equalising) functions of the Sony MU-R201 can be used to change preset reverberation effects and to produce original settings. Besides the 100 factory-preset characteristics, a user memory for another 100 settings is provided, offering unlimited creative potential. 10 basic modes on the Sony MU-R201 serve as reference, complemented by many versatile effects, such as hall ambience, acoustically “live” room effects, tightly controlled plate reverberation, percussive multi-gate reverb and multi-reverse reverb. The dual multi delay setting offers up to 20 repeat outputs for each channel separately, and reverb & gate effects further enhance versatility. Memory selection and adjustment is simple and straightforward, for easy operation also during a live performance. In modes 3 (Multi Gate Reverb), 4 (Multi Reverse Reverb), 5 (Dual Multi Delay), 7 (Dual Reverb), 8 (Reverb & Gate), and 9 (Reverb & Delay), the two channels of the Sony MU-R201 operate separately. This permits use, for example, with two different instruments during recording or a live performance. Up to 26 parameters can be set, to design exactly the sound field you want and to create special effects not available in ordinary surroundings. The Sony MU-R201 incorporates a programmable two-channel four-band equaliser (LOW, L-MID, H-MID, HIGH). Equalizer data can be stored along with effects settings, to instantly provide the desired sound shaping characteristics for each application. An optional remote control unit (Sony MU-RM1, cabled) permits operation of the unit from any convenient location. A foot switch (FS-11) can be used to increase or decrease memory numbers, switch effect processing off and on, and suspend effects. Two sets of input/output jacks are provided, to accommodate either standard phone plugs or RCA-type phono plugs. A +4/-20 dB LEVEL selector matches the unit to professional or consumer equipment and any musical instrument. 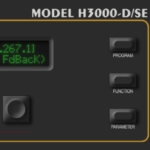 The integrated MIDI interface accepts program change signals for external selection of memory numbers during a performance. The effect level can also be controlled via key-touch and control change signals, making the Sony MU-R201 ideally suited for use as an effecter for digital instruments.